How did this signage pass through many layers of Hong Kong bureaucracy? This afternoon I happened to be near the Hong Kong Museum of Art in Tsim Sha Tsui that is undergoing a massive HK$930 million expansion so that it will have 40 percent more exhibition space by the time it re-opens in mid-2019. As a result there's hoarding around the pink-tiled building and what does it say on it? Since when was facelifting a verb? 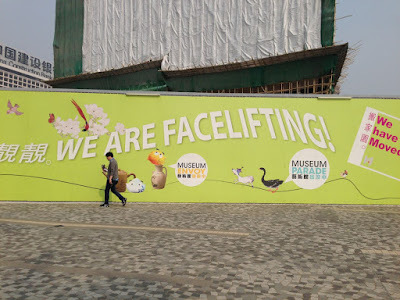 Who approved the words on the hoarding, because it's not the right use of the word, which means a cosmetic surgery procedure. As far as I know Chinese and English are the official languages of Hong Kong -- how did this sign surrounding a government-funded building get approved?